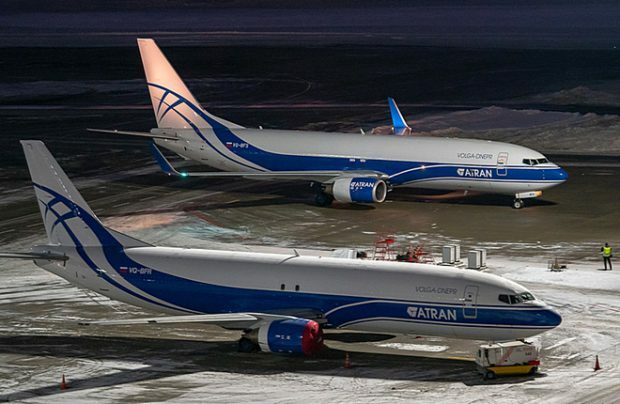 Atran Airlines, the Russian air express cargo carrier within the Volga-Dnepr Group, has enlarged its fleet with the delivery of its first Boeing 737-800BCF, increasing its total number of narrow-body freighters to five. The CFM56-7B24-powered aircraft, with tail number VQ-BFS (MSN 32616), is one of two Boeing Converted Freighters (BCFs) which are on lease from GE Capital Aviation Services (GECAS). Having successfully completed certification of the Boeing 737-800BCF in Russia, the airline is the first to operate this type of freighter, thereby enabling Atran to benefit from its enhanced operational capabilities on short- and medium-haul routes. The additional aircraft will boost the carrier’s capacity whilst giving a broader choice of logistics solutions linking routes between Russia, the CIS and Europe. The freighter has already operated its first flights from Moscow (Vnukovo) to Norilsk and Yakutsk, carrying consumer goods for the population of the Siberian and Far Eastern parts of Russia, including perishables, general cargo and e-commerce shipments. “As the upgraded version of the Boeing 737, this airplane has more technical and operational capabilities. It allows us to offer more main-deck cargo capacity thanks to the aircraft’s extended, broader fuselage, which is six metres longer, and increases the solutions we can offer for the transportation of various types of shipments, including oversized freight which can be loaded through the wider main-deck cargo door,” explains Dmitry Obsharov, Atran’s general director. “We are confident that with this new aircraft type we will be able to guarantee high service quality for our customers, leveraging trade flows in the markets we serve, with a special focus on China-Russia routes and the emerging volumes of cross-border e-commerce and mail shipments. It will also help to increase aircraft utilisation within our existing network,” Obsharov adds. In addition to offering 11 standard aviation pallet positions and containers in the cargo compartment, the Boeing 737-800BCF incorporates a reconfigurable cargo handling system that can easily be adjusted for various types of unit load devices (ULDs). Atran describes the -800BCF as “an ideal aircraft for European short and medium-haul cargo operations”, citing its advanced technical characteristics, together with its ICAO Stage 4 noise certification. Atran Airlines is one of the oldest established, Russia-based specialist airfreight carriers. Acquired by the Volga-Dnepr Group in 2011, its fleet presently includes four B737-400SFs as well as the newly added B737-800BCF, all operating from its base at Moscow’s Vnukovo Airport. The B737-800BCF is a newcomer to the Volga-Dnepr group and complements its existing fleet of Antonov An-124-100s, Ilyushin IL-76TD-90VDs, Boeing 747Fs and Boeing 737-400Fs.